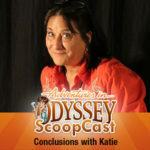 The Odyssey ScoopCast continues a review series you won’t want to miss! The ScoopCast concludes its review of “Life Expectancy” from Album 57: A Call to Something More. The podcast team discusses the introduction of potential love interest Jeff Lewis, Connie’s future story in Adventures in Odyssey, and where the show is headed in the days ahead.